Overwhelmed with the logistics of planning your big day? Join the club! We asked top wedding professionals and real brides around the country to divulge their stress-less secrets. 1. Consider choosing a singular location that offers hotel accommodations, as well as ceremony and reception capabilities. Mary Bradley, the owner of Mary Bradley Events, recommends selecting one site where all of the festivities can take place, which will help you save money, cut down on time and eliminate transportation logistics. 2. Get married in an (almost free) space. 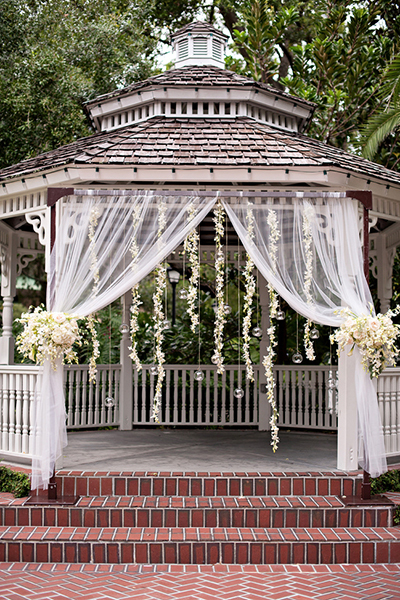 Some public sites like parks or gardens allow you to tie the knot there in exchange for a small donation. Shannon Mcnay, a personal finance writer who recently planned her NYC wedding for less than $5,000, opted to wed at a community garden in the East Village. She said, "My husband and I are from different religions, so we chose to get married in a neutral place. 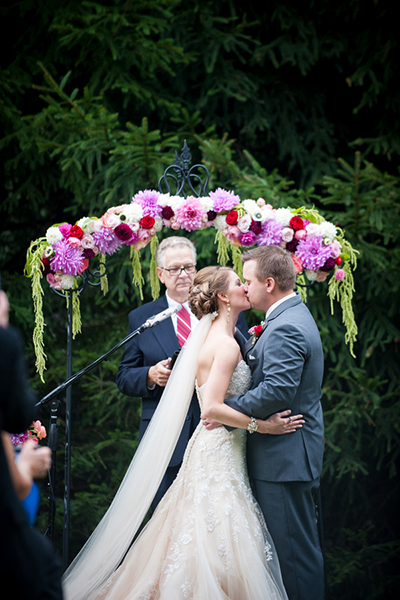 It was beautiful and it provided exactly the setting we wanted -- a small urban oasis." 3. If you're willing to be flexible on your exact date...wait until four to five months before your desired wedding month to book your venue. Most couples select their date and site at least one year out, but according to Grace Eurglunes, a wedding planner at The Addison, there is major bargaining power to be had for those with a shorter timeline. "You can save up to half the cost on your venue, food, and more, as all wedding professionals are looking to fill upcoming dates where they have nothing booked yet," she advises. 4. Decipher wedding testimonials to determine if it's worth meeting with a potential vendor. It might be tempting to scan online reviews based on ratings alone but wedding photographer G.E. Masana advises filtering through them more carefully. Reviews fall into three different categories: the "exit door" review, where a bride and groom haven't yet experienced the service but are enthused about having contracted that vendor; the "good guy" review, where the vendor delivered perfunctory service and therefore, the couple had nothing special to say (e.g. "Bob showed up on time and was very accommodating"); and lastly, the "exceeded expectations" review, which is the best kind to look for. In this kind of testimonial, the couple isn't just satisfied -- they're beyond thrilled and they mention specific details about why this particular professional blew them away. 5. Attend bridal shows and expos early on in your engagement. "There's no better way to get inspired with new and unique ideas than by seeing them firsthand," says Carole Trulio, the Catering Manager for Four Seasons Hotel in Atlanta. Plus, you'll be entered into raffles where you could score a free honeymoon, gown or more! Just create a wedding-only email address beforehand so that you don't get inundated with messages while you're at work. 6. Never buy your wedding gown at full price, says Emily Duke, who managed the client relations department for a very famous bridal salon. She tells us that brides' best bet is to attend designer trunk shows. "A rep or the designer will be there and can offer a better sale price or gift you custom changes (hollow to hem, neckline, straps, etc.) additional items (belt, bolero, etc.) and so forth," Emily says. Check out gown shopping tips from Randy Fenoli. 7. Have your seamstress sew undergarments into your dress. Celebrity event planner David Tutera reveals that "You'll feel much more comfortable and secure -- this will avoid the need to tug and pull on your gown while you dance the night away!" 8. Book as many services as you can with a single vendor. For example, if your wedding planner or florist offers lighting, rentals and invitations, you can potentially score a big discount for packaging them together, rather than hiring different vendors to execute each element. You also have more room to negotiate. Here's what to ask before you book your vendors. 9. Don't just tell your vendors what you like. It's important to actually show them! For example, there's hundreds of variations of blue, so rather than leave any room for interpretation, Krystal Tien of Couture Events recommends giving a Pantone color swatch to vendors so that you're all on the same page about what "dusty teal" looks like. Browse 200+ beautiful color-combinations for your wedding. 10. Can't afford a professional wedding video? Hire a shooter just to capture raw footage. That way, you can capture all of the memories and have them edited into a video at a later point in time (say, after you're received any monetary wedding gifts). If that's still completely out of your budget, Martine Boursiquot-LaConte, the owner and founder of This Modern Love Events, suggests flipping the script by renting mini video cameras from WeddingMix. For a fraction of the cost of professional videography, you can assign a specific number of cameras to relatives or friends. After the wedding, you mail them back to the company and they'll edit your footage into a full-length video for you. 11. Buckle down and make an alphabetized Google doc with your guests' names and addresses after you get engaged. Although it might seem daunting, "If you keep organized from the beginning, this will make your life much easier during the crunch time of figuring out your final guest count," says Sunny Ravanbach, the president and founder for White Lilac Events. Hosting your doc in the cloud allows you to easily share info with your fiancé, your parents, or any other VIPs who may need to access it and make revisions. Always store a hard copy for back-up, just in case. 12. 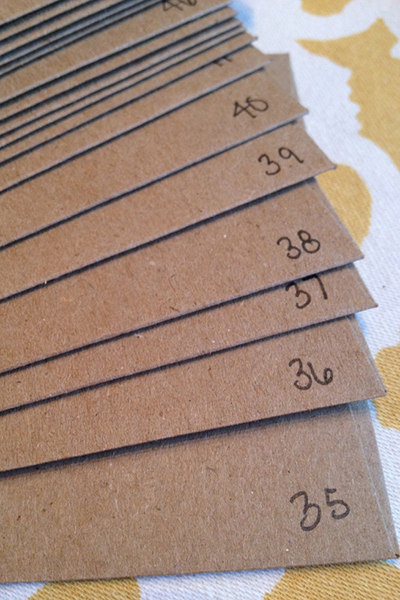 Number the back of your RSVP cards to correspond with your address document. Davia Montoya, a real bride and the owner of Davia Lee Weddings & Events, explains that this will not only help you figure out which cards might be missing, but will also help you decipher difficult-to-read responses. 13. Address thank-you notes ahead of time for guests who send a gift prior to the big day. Jodi R.R. Smith, a national wedding etiquette expert, clued us in to this genius time-saver, which will give you one less thing to do post-wedding. Acquaintances or friends of relatives may want to give you a present even if they weren't invited to your big day, so thanking them now ensures that you won't be scrambling to keep track of rogue thank-yous that you forgot to add to your address doc. If you're super ambitious, you could also address the thank-you envelopes for all of your guests ahead of time. Learn how to avoid the most common post-wedding mistakes that newlyweds make. 14. Repurpose your ceremony blooms for the reception. Lynn Jawitz, the owner of Florisan Wedding and Event Design, suggests asking your florist to create a wide horizontal flower piece on the arch or chuppah, if you're having one. After the nuptials, he or she can cut it down and tuck the wires under (or remove them completely), transforming it into an instant sweetheart table arrangement. 15. If your venue hosts multiple weddings in a weekend, ask what rentals the other brides are using. If you're flexible, some sites will allow you to leave up the decorations from the previous wedding or they'll bring the rentals from the next wedding in early. Crystal Chu from Bloominous, a website that helps couples put together their own DIY centerpieces, reveals that "The wedding after us rented the party string lights from the site, so they just put them up early and we got to use them as well." 16. Love peonies, which are the most requested flower at weddings? Try using cabbage roses, instead. "Most people could never tell the difference. Best of all, they are way less expensive and available all year long," says Tracie Domino, the founder and creative director for Tracie Domino Events. Use this handy chart to see which flowers are in season for your wedding . 17. Consider having a trial for your wedding décor, just like you would for your hair and makeup. Celebrity event planner Colin Cowie explains that a creative presentation is a scaled-back version of how your reception tables will look and feel on the big day. "It serves as a great visual, allowing you to see how different textures and colors you've chosen do (or don't) fit together," he says. After all, no one wants to spend a small fortune on centerpieces only to walk into their reception room and be disappointed with the way they were executed (which could have easily been avoided). 18. Bring three pairs of shoes with you on the big day: heels, wedges and flats. It might seem excessive but you'll be grateful for the backup plan in case your heels break or you need a rest halfway through the day! If you'll be taking lots of photos outdoors, we recommend using Solemates heel protector caps, which help you balance your weight when walking on uneven surfaces like grass or cobblestone streets. Worried about getting painful blisters by the end of the night? Ashley Lloyd, an event planner for Attention 2 Detail Events, advises rubbing Band-Aid's Friction Block Stick on your toes or wherever your feet are sticking: "It's like wearing a sock under your shoes!" she says. 19. Keep your gown and veil in place during a windy outdoor ceremony or photo session. Tutera and Trulio recommend sewing small weights disguised as gem or pearl accents to the edge of your veil or the hemline of your dress to prevent it from flying up. 20. DIY your makeup like a pro. Celebrity hairstylist/makeup artist Amanda Shackleton of NY Bridal Beauty let us take a peek at the must-have products inside her bridal beauty arsenal. She starts by applying a silicone-based foundation, which is naturally waterproof. "Buffing in circular motions blends out the foundation to an undetectable finish and it's super light reflective, so your skin glows!" she reveals. Using waterproof mascara is a given, but did you know that pros coat the back of brides' eyelashes with it as well? ("It's a great trick to make lashes look thicker," she says.) No cry-proof look is complete without Make Up Forever's Aqua Seal: It intensifies the pigment of any eye shadow and makes it completely water resistant. Check out beauty secrets from around the world. 21. 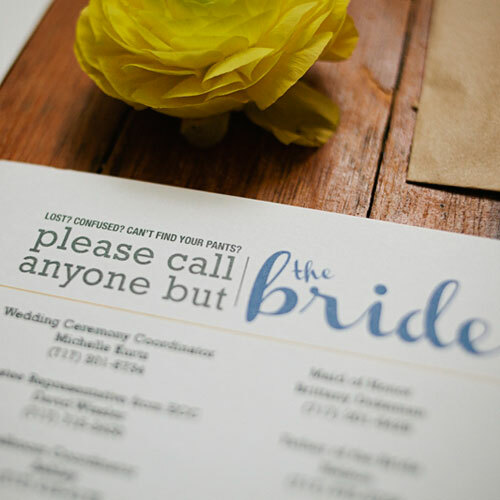 Pre-empt those frantic wedding-morning phone calls -- while you're trying to get your massage or hairstyle done in peace -- by providing a detailed printout of whom vendors should call in case of an emergency or last-minute question. 22. Tuck a few pregnancy nausea lozenges into your getting-ready bag. Believe it or not, "They taste good, they work quickly, and are a great fix to use in a pinch." Blake says. 23. Use the "balloon trick" to keep little people in line during the ceremony. We recommend doing a trial run with your flower girl and ring bearer before the big day so that they can become acquainted with the space. Claire Baxter, a wedding planner at The Wedding Company, also shared this fun trick with us: tie a pretty helium balloon on a string around their wrist! "They will be awestruck watching it, they will 'follow' it up the aisle and it will keep them entertained for just the right amount of time," she says. 24. Get someone you trust to listen to the speeches in advance. "You want them to be 'new' to you on the big day, but knowing that they aren't inappropriate/boring/long will give you one less thing to worry about," Baxter says. 25. Just say "yes." According to Terilyn and Koby Brown of Archetype Studio, this relaxes the jaw line, separates your lips and automates a naturally pleasant expression. Check out 75 new must-take photos with your groom.